Cities for or against citizens? This paper discusses design considerations for creating high quality civil works with an emphasis on bridges. The authors pursue a design study and analysis approach to highlight the specifics of infrastructure design for regional identity, based on their own work on a series of bridges in the Dutch Zaanstreek region. Subsequently two highlights of the authors work, the award winning Juliana Bridge and the wildlife crossing in Rijssen, are used to illustrate how to create good infrastructure design in sensitive contexts, without making use of a neo-vernacular vocabulary. This paper investigates the symbiotic relationship between the architectural appearance of a bridge and the structural design. The research is done by reviewing and comparing the design methodology employed by the first author in the conceptualization of two of his bridges; an early work from 1997 and a recent work from 2017. The review of the early work describes a design methodology that could be described as intuitive design, whereas the later work is the result of computational from-finding and optimization. Parallels are drawn and the historical development of the toolbox of the architect and the engineer is described. The paper analysis the way the two designs were achieved by looking from the perspective of the architect and that of the engineer. The paper concludes by identifying the key design considerations to achieve a beautiful yet structurally sound bridge. The question whether beauty can be the sole result of a rational design process towards the most efficient form according to the laws of mechanics, is addressed. 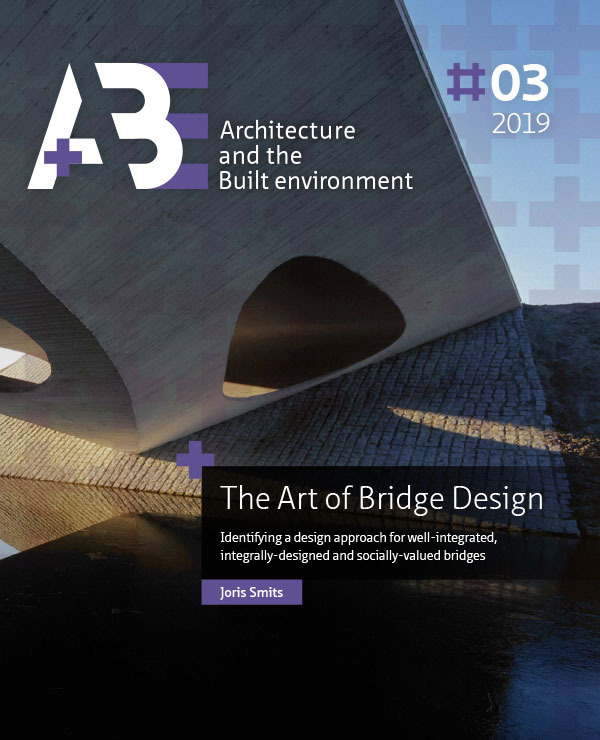 This paper demonstrate the belief that when it comes to the design of a bridge, architecture and structure, form and force, are involved in an interdependable and symbiotic relationship. This paper reviews the use of fiber-reinforced polymers (FRPs) in architectural and structural bridge design in the Netherlands. The challenges and opportunities of this relatively new material, both for the architect and the engineer, are discussed. An inventory of recent structural solutions in FRP is included, followed by a discussion on architectural FRP applications derived from the architectural practice of the author and of other pioneers. This paper deals with the design, production and monitoring of a bio-composite footbridge with a span of 14 meters across the river Dommel in the city of Eindhoven, the Netherlands. The specific bio-composite material that was used for this research is a Natural-Fibre Reinforced Bio-Polymer (NFRBP). The goal of the research is to prove that NFRBP can be applied as a load bearing structure in an outdoor environment. For this purpose, a multidisciplinary team of academic researchers from two universities, together with a manufacturer from the NFRBP industry and the Centre of Expertise Biobased Economy (CoEBBE), developed a feasible design that could be produced by unskilled hands in a short period of time and within a limited budget. The footbridge was designed, built and installed within less than one year. In the two years after the installation of the footbridge, the structural behaviour of the bridge was monitored by means of optical fibre glass strands, integrated within the structure, with the purpose of measuring deformations and change in elasticity that occur over time. In the previous four chapters design considerations for bridges have been identified at the four principal scale levels of the design; the scale of the landscape and the city, the scale of the bridge itself, the scale of the detail and at the scale of the composing material and the material properties. This chapter provides an integrated discussion and conclusions on the broad field of bridge design as it is outlined in the main body of this dissertation. The following chapter, Chapter 7, presents the recommendations for future research. This final chapter closes this dissertation and provides recommendations for future research. The price of houses in Amsterdam, whether rising or falling, influences house prices in a large part of the Netherlands. This is an important result of Alfred Teye's PhD research because insight into house price developments and risks in the housing market is crucial for society. Although a curved form is known to be stronger than a flat structure, we do not know exactly how much stronger. Doctoral candidate Qingpeng Li tried to find out by testing various shell structures. His findings show that even a small curve can provide significant reinforcement.